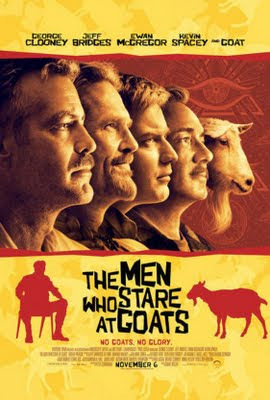 Much like my Variety colleague Derek Elley, I enjoyed The Men Who Stare at Goats as a satisfyingly quirky mix of straight-faced, off-the-wall absurdism and darkly comical political satire, featuring splendid ensemble work by the exceptionally well cast George Clooney, Jeff Bridges, Ewan McGregor, Kevin Spacey and Stephen Lang. But I must admit: When I viewed the Overture Films release Sunday, I was temporarily shaken by the unfortunate timeliness of a scene in which a berserk solider opens fire at other service personnel at a U.S. Army base. Ironically, George Clooney and I talked about the potential for real-world tragedies affecting audience reactions to reel-world scenarios back in 1997, when I did this TV interview with him for The Peacemaker. That movie, you may recall, dealt with efforts to prevent a grudge-bearing Bosnian from setting off a nuclear device in New York City. Clooney admitted that he and other folks involved with the production had discussed the dreadful possibility that a similar terrorist attack might actually occur before Peacemaker hit theaters. And while they ultimately decided that they couldn’t worry about things over which they had no control, that they could only hope for the best while trying to make the best movie possible, Clooney pointedly noted the box-office failure of SpaceCamp, a 1986 adventure movie – about kids at a NASA summer camp who are accidentally launched into space -- that had the misfortune of opening a few months after the Challenger space shuttle disaster. Fortunately for all parties involved with The Peacemaker – and for even more parties who had nothing whatsoever to do with the film – no major terrorist incidents occurred in the U.S. before or during the film’s theatrical run. In 2001, however, a broadcast TV airing of The Peacemaker was cancelled at the last minute because of… well, spectacularly bad timing. You see, the movie had been scheduled to air just a few days after Sept. 11. What about the excellent anti-military black comedy Buffalo Soldiers? Didn't that get yanked from release after 9/11?